Hollow Rock Address Rock - - personalized with your home address. 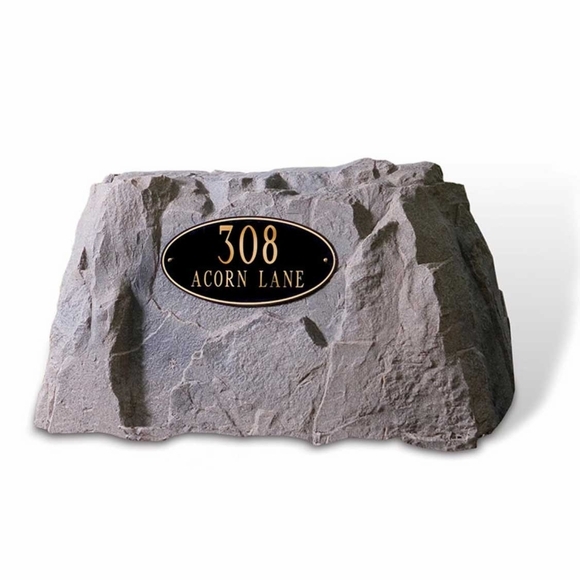 31" x 21" hollow artificial rock not only hides unsightly utility components but also has a flat face that holds your address sign. Made in USA. Eye-catching address marker features three-dimensional, metallic-faced characters and trim. Long-lasting stainless steel mounting hardware included. Four shapes: oval, standard rectangle, modified rectangle with semi-circular side edges, and rectangle with cut corners. Three color choices: copper with black numbers, gold with black numbers, and nickel with black numbers. Holds a two-line address and comes in three color choices: copper with black numbers, gold with black numbers, and nickel with black numbers. Character height ranges from 1.5" to 3" depending on the number of characters. 5-year mfg. warranty on sign. The artificial rock is made of lightweight, durable RealRock that is virtually indistinguishable from a real rock. residential backflow assemblies 3/4" - 2"
Patented flange design secures the enclosure to the ground. Includes 6" plastic ground stakes. Commercial-grade construction stands up to weather elements. Lightweight, easy to move, and durable. Rock will not fade in sun or crack in cold weather. Four rock colors: autumn bluff, fieldstone gray (shown in large picture), riverbed brown, and sandstone tan. Rock dimensions: 39"W x 21"H (note: length is taken at the base; height is the highest point). PLEASE MEASURE the device you need to conceal carefully before ordering to make sure it will fit inside the rock. And please consult the size chart shown above. Note: Because the rock shapes are irregular, measurements should be used as a guide only. If you are uncertain as to which hollow rock enclosure to order, please send an email to customer service. Please tell us the type of object you will be covering and its dimensions. Made in USA of recyclable materials. Artificial rock enclosure hides yard clutter that need hiding and includes a personalized house number sign. Thank you to customer Clare Shaffer for sending in a photo of her address rock with her below review. See first small image on right above and click on it to enlarge. This is the 651 rectangle, riverbed brown rock, nickel with black number sign. Needed an address marker for my vacation rental and this suited me perfectly. Easy installation and very attractive!